". . . we call it the Last War, not because it was mankind's final battle, but because the world which started the war no longer existed by its close. It lasted forty years, and it saw the destruction of four mighty empires. Two generations never knew a world without conflict; few were not personally touched by its ravages, and fewer still remembered a world without Ogres . . ."
– from "After the Long Winter: Roots of the New World"
Click on any part of the map, or choose one of the regions below. The Ogre Timeline, as originally published in Ogre Miniatures. The Factory States, by Mike Naylor and David Graham, from Pyramid #2. 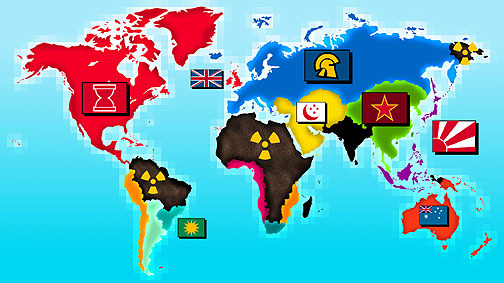 An outline of history after the superpowers destroyed each other.